Excellent contributions everyone. Keep them coming! in somewhat distorted yearly and regional comparisons. I'll try to have an update on this around the end of next week. Two bottles of a Cabernet-Sauvignon from Mendoza, Argentina may not be enough celebration for this new all time high, not just because it's a new ATH, but rather for what we've been through over the last couple of years, and survived... and most impressively, for the short time it took to get us back on track. But I think I have some soul-searching pending, and so, that third bottle can wait for tomorrow's confirmation of an official close above $199.83. I just need to get this out of me now, and more wine might not help with that. So here we go... well, that was quite embarrassing! Apple swept all across my estimates (and everyone else's). I feel the need to apologize to my readers for such a clueless prediction. I was off in almost every category that's meaningful, and missing the bottom line by 16% is more than 7 times worse than my average performance over the previous 8 quarters. I really hope this is a one-time thing. I feel somewhat responsible if anyone decided to make serious bets or hedges out of my misguided conservatism. If you did, I owe you one, and I hope to make it good next time. I normally try to focus on the long term (and that's what my targets up in the high 200's are for), but I know this time I've expressed more concern about a short-term correction than at other times, due to the modest numbers I was seeing for last quarter. 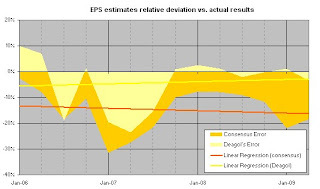 In my defense, the second most significant reason for my huge EPS miss was such a forgiving effective tax rate reported. Apple guided for 30% and I estimated 29.1% tax, based on historical trends. The report showed an effective tax rate of 25.6%, which would explain away about 30% (or about 8.5¢) of the 29¢ miss. The rest, the most significant reason for the miss, of course comes from underestimating revenue by more than half a billion, and then gross margins came 40 bps higher than I expected (Apple guided for 34%, I was at 36.2%, and the report came at 36.6%). Only a couple of cents were due to the slightly lower OpEx and slightly higher interest income than I was modeling for. So the real organic upside (for me and most everyone else) mostly came from the revenue side of the equation. Of the roughly 20¢ remaining due to the revenue miss, more than 2/3 (or half of the whole 29¢ miss) are due to the Mac's incredible performance. The rest is about 3 cents due to a surprisingly rising iPod ASP's, a couple of cents from iTunes upside, and another 2¢ from peripherals (most likely stemming from high attachment rates to Mac sales). Usually, I get all these revenue sources to fall on both sides of the fence so that they cancel each other out and thus allows me to get pretty close to the overall numbers, but this time I only had SW on the plus side, which barely took care of my relatively accurate but slightly lower iPhone revenue. So, let me focus on the Mac. First, more than 3 million Macs, baby! 17% unit growth with the industry flat, and portables growing a scorching 35%. That's 300k more units than already lofty expectations (considering the economy) of 2.75M. But that's not what impressed me the most. What I couldn't believe and I'm still not sure how to explain is the sequential increase in Mac ASP's. Didn't we just see Apple lowering prices, most steeply for laptops (the star of the quarter in terms of units) by hundreds of dollars? Isn't this the back-to-school quarter when many college students are getting their first self-purchased computer, and are extremely price conscious and tech savvy on all the cheap alternatives, netbooks, or aware of the "benefits" of a true gaming rig, a perennial "weakness" for the Mac? Wasn't this the quarter in which Microsoft supposedly got serious about conveying, through supposedly quite strong advert messages, the value advantage of going with a PC? Wasn't this supposed to be a quarter where the consumer would be spend-thrifty, and only buy absolutely necessary products? So, how on earth did ASP's go up sequentially (although minimally)? I guess it's gotta be those $1700-$2500 15" and 17" MBP's that must be getting crazy popular among college students, perhaps precisely thanks to their reduced prices, but also obviously due to the unmatched features, quality, and experience. Could the secret to this success be as simple as just providing a satisfying, fun, high-quality, highly-valued experience for customers? Wait, that actually sounds like an obvious tautology. Well, not that obvious to some, perhaps. Let this be my mea-culpa. I was wrong about the Mac! Not the iPhone, not the iPod, but the Mac, the segment that I'm always willing and eager to get bullish about. And I was afraid my 2.85M current and future unit estimates were at risk. Silly me. What did I get relatively close? A few inconsequential things: the OpEx number, the absolute tax provision (whatever), the shares outstanding (easy), the GM% (thankfully I read Turley's articles and dismissed PO's lame guidance), the iPhone revenue (not the ASP's, again those are out-of-this-world high, but it only gets reflected on the non-GAAP numbers), the iPod units, and the Mac ASP's (again, those are incredibly holding up but thankfully I didn't expect them to fall too much and thus avoided an even worse miss). Oh, and I definitely got the subscription accounting change non-event right, first from my intuition of a bait-and-switch setup and later exclusively confirmed two weeks ago here through Joan Hoover's email. "Investors who have waited and waited for a great time to buy Apple (AAPL Quote) will get their chance next week,"
Yea right, at a $10-$15 higher price! He was already working up the option volatility play for the benefit of his option-writing, market-maker puppet masters, IMO. Oh well, I guess that's what makes him a professional, and makes me an amateur. One last thing, I seriously, truly nailed that guidance estimate, didn't I. Analysts consensus   11.44       ? 1.91       ? Apple guided for GAAP in a range of $11.3b to $11.6b revs (midpoint is $11.45b!) and $1.70 to $1.78 EPS (midpoint is $1.74!). That's the one thing I'm really proud of this time. Congrats to all longs, and see ya soon at $300! Check back here Monday at 4:30 pm EDT for the results. Analysts cons. 9.19    1.42     ? Analysts consensus    42.44       ? 7.05       ? 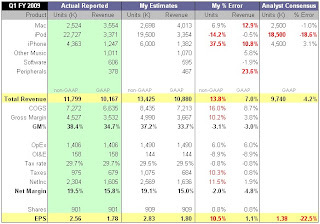 A week ago I shared a few details about my iPhone unit estimates and the GAAP vs. non-GAAP valuation implications. Today that post was featured by Philip Elmer-DeWitt's Apple 2.0 blog. Welcome to all visitors from there, and thanks for the plug PED! This weekend I was tweaking that very conservative iPhone unit forecast, seeing if I should take into account the recent report by Gartner (2012 estimate of 71M iPhones) despite it's questionable soundness. So in the end I just decided to raise my forecast by about 10%. FY2010 and 2011 iPhone unit estimates go to 30M and 36M respectively (from 28M and 33M previously), simply because it feels as is someone is really getting scared. Stay tuned for last quarter's final estimates, revenue breakdown, full financials, and guidance prediction next week. Once again, last quarter was quite eventful. 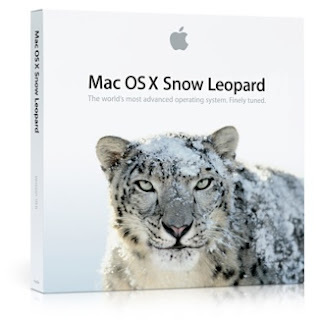 From modeling the Snow Leopard release to revisiting all the accounting rules. From tweaks on the new iPods with lower price points to considering the data on "iTunes credit cards" or a gazillion downloaded Apps. From potential iPhone channel fill in China to new carriers in the UK. From halved Net Applications Mac web share data weightings to the weak dollar effect. From industry reports of a big turnaround in the PC market to short-term valuation concerns given the non-stop rally. On top of all that, I finally dumped my clunker PC for good, and spent weeks tweaking the charts and formats in Excel for Mac (forcing me to use the "new" .xlsx format). 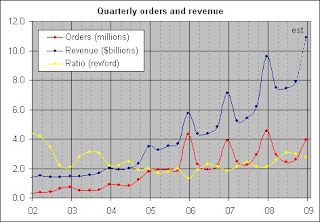 As if all that shuffling weren't enough, Apple decided to skip some 16M numbers from the US web order sequence. That was fun. Not jumping onto the accounting change until Apple says precisely what they're doing. 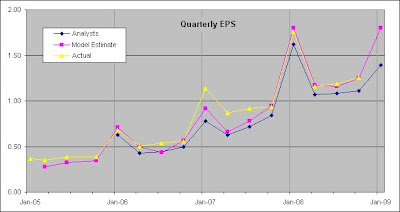 If they were to completely eliminate subscription accounting it would raise my FY09, FY10, and FY11 EPS estimates by 51%, 20%, and 11%, respectively. 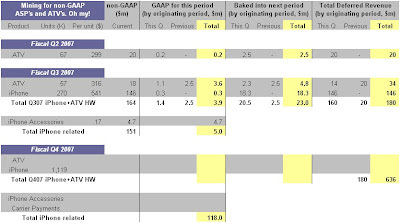 This relatively quick "filling of the GAAP" is mostly due to my conservative iPhone projections of 28M and 33M units for the next two fiscal years. I'm sure I will feel more justified in raising these mid-term projections as we climb out of the recession. 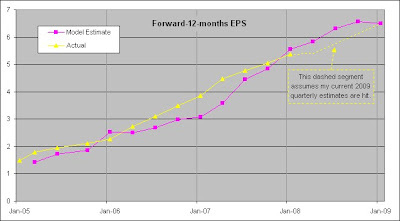 Given that my target is based on 2-years forward-looking EPS, the effect on it from the accounting change would be modest ($267 vs. $239), even on the Fair Value ($242 vs. $210) which is based on 1-year forward EPS, and would rather be felt on the trailing valuation ($231 vs. $160). Perhaps AAPL would then seem appetizing even for those who value stuff looking at the rear-view mirror. I love the predictability of subscription accounting and I wish they could keep it (heck, I wish they could get iPods and Macs under subscription accounting!). I don't buy the supposed obscurity argument against it. 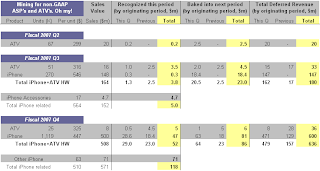 Whoever's big enough to move the stock must know to use non-GAAP or cash flows valuation. In my opinion, AAPL is not undervalued because of this issue. Instead, it's being used as an excuse for analysts raising their "recessionary" estimates (both GAAP and non-GAAP) and targets without them looking like they've been completely wrong for the last couple of years, as they have. All this smoke-and-mirrors stuff (with Jim Cramer blowing up an accounting change mini-bubble) and the likelihood of a broad market correction does make me a little nervous in the short term. Full numbers in a couple of weeks. Thanks to all who've contributed their web order numbers. Keep them coming!